(20246.38.282.2, John Melton Collection, OHS). (20246.38.104.5.A, John Melton Collection, OHS). 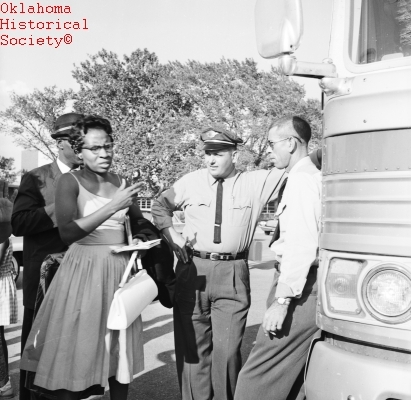 Educator and Civil Rights leader Clara Shepard Luper was born in Okfuskee County, Oklahoma. The daughter of Ezell and Isabell Shepard, she married Charles P. Wilson and had three children, Calvin, Marilyn Luper Hildreth, and Chelle Marie. In 1944 Luper received a bachelor's degree from Langston University. She later attained a master's degree from the University of Oklahoma in 1951 and was the first African American admitted to the graduate history program in the University of Oklahoma. Luper taught history and public relations at Dunjee High School in Spencer, Oklahoma, and at John Marshall and Classen High Schools in Oklahoma City. While teaching, Luper wrote, directed, and produced Brother President, a play based on the life of Martin Luther King, Jr.
Luper became the advisor for the Oklahoma City National Association for the Advancement of Colored People (NAACP) Youth Council in 1957. The following year the Youth Council decided to stage a "sit-in" at Oklahoma City's Katz drugstore. On August 19, 1958, walking into the store and ordering Cokes, the youth, under Luper's guidance, demonstrated their discontent with segregation and launched the nation's sit-in movement. The Youth Council continued to conduct sit-ins throughout the early 1960s, helping to end segregation in public accommodations in Oklahoma. 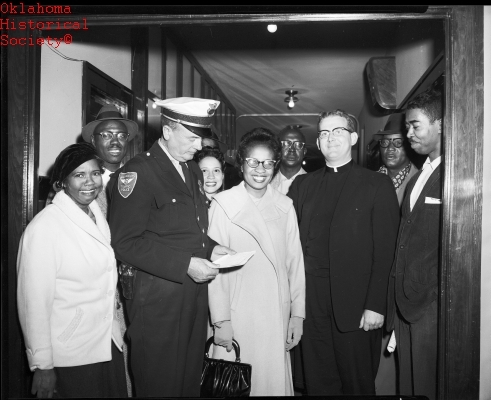 Maintaining her adherence to nonviolence, Luper participated in marches and demonstrations and was often jailed in her Civil Rights struggle. From 1960 to 1980 Luper hosted her own radio show, and she chronicled her fight for Civil Rights in her autobiography, Behold the Walls. A member of Zeta Phi Beta sorority, the Oklahoma Education Association, and the National Education Association, Luper received 154 awards, including the Langston Alumni Award, Zeta Phi Beta Woman of the Year Award, the Oklahoma Confederated Women's Club Award, and the National Voter Registration Award. She died on June 8, 2011, in Oklahoma City. Gene Aldrich, Black Heritage of Oklahoma (Edmond, Okla.: Thompson Book and Supply Co., 1973). Carl R. Graves, "The Right to Be Served: Oklahoma City's Lunch Counter Sit-Ins, 1958–1964," The Chronicles of Oklahoma 59 (Summer 1981). Stefanie Lee Decker, "Luper, Clara Shepard," The Encyclopedia of Oklahoma History and Culture, https://www.okhistory.org/publications/enc/entry.php?entry=LU005.